Solarvalue delays production again and will invest remaining capital in test furnace. 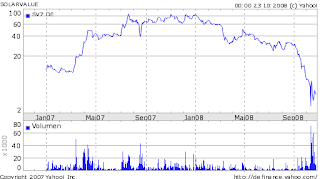 Solarvalue shares to split 8:1 effective today, October 24, 2008. It’s been 179 days since my last Solarvalue AG (FRA:SV7) post. I hinted at a Ruše Surprise repeat in my last post, Solarvalue produces Solar Grade Silicon sample material. My hint became truth with “Solarvalue reorganizes planning cycle; Deferment in industrial production ramp up” (Deutsch) earlier this month. Solarvalue now plans to build a test furnace enabling delivery of some hundred kilogram samples to potential customers. This Handelsblatt.com article, “Unreines Silizium sorgt für saubere Energie” (German only), by Sascha Rentzing had poor timing just days before the Solarvalue production deferment announcement. The capital increase planned for 2008 could not be performed due to a law suit initiated by one shareholder with one share and the unexpected financial market crisis that significantly lowered the Solarvalue share price. And there are two new entries by John Mott in NEWS FROM RUSE – THE BLOG (Deutsch). Reading between the lines, it looks like Boron removal may still be a challenge for Solarvalue. Solarvalue post split shares traded early in the €0.41 to €0.99 range in Frankfurt or visit XETRA:SV7 for the latest quote.